On the Import tab, in the Bibliography group, choose an option. If you have already created files in your project that correspond to bibliographical data stored in a reference management tool, you can import the bibliographical references and link them to the existing files. CAUTION If your existing files have linked memos and you choose to replace memo contents with abstract, keywords and notes, you will lose any existing content you have currently recorded in the memo. If the memo content is important to you, you can unlink the memo and associate it with the file using a see also link, before you import the data, so that your existing memo is retained in the project, and the abstract, keywords and notes are written to a new linked memo. Already linked includes references that were previously imported from EndNote. To be linked includes references that match names of existing files. Follow the steps for importing references for your reference management tool as above. Under Matched Files, select <Select Existing>. Select the file to be matched to the reference and click OK. When you have finished matching references, click OK. When matching references to existing files, NVivo matches based on their EndNote ID (if available), otherwise NVivo matches on title (default) or author and year (when this is selected in the Name files by list). If the reference that you manually match to a file contains an attachment, URL or reference, these will not be imported as content in order to preserve your existing file. However, the reference data is stored as attribute values on the file. By default, file names are based on the title of the publication (for example, 'Rising seas in the Pacific'), but you can change the import options to use the author and year of the publication as the file name—for example, 'Smith, Andrew (2010)'. Title (or author and year) is used to name the file—this information is also stored as attribute values on the file. 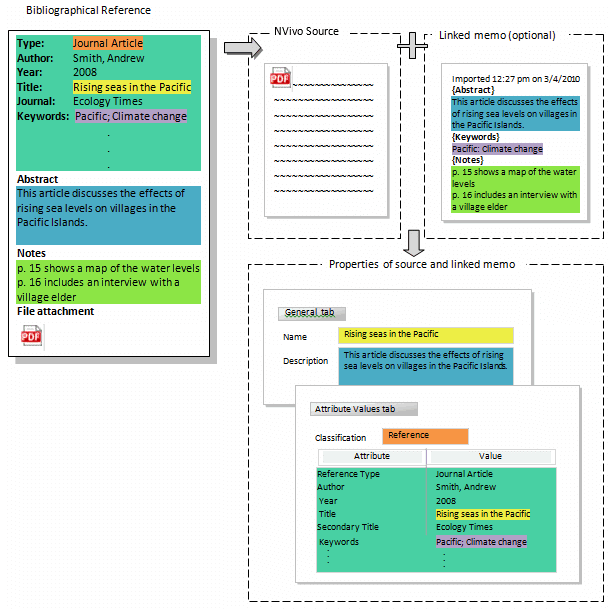 If you accept the default import options, then a reference will be imported into NVivo, as shown in the diagram below. Only one file attachment, URL or figure per reference can be imported into NVivo. For example, if a reference contains multiple file attachments, then, by default, the first file attachment is imported—if you want to import a different file, click the Advanced button (on the import dialog box) and select the file you want to import for that particular reference. The path and file name for all file attachments, URLs or figures are recorded in the file attribute values. In Navigation View, under Data, click File Classifications. Select one or more file classifications to export. On the Share tab, in the Export group, click Export Bibliography, and then choose an option. (Optional) Change the name or location of the exported file. If you are exporting a large amount of classifying data, the export may take a few minutes. You can monitor the progress of your export in the Status bar at the bottom of the NVivo window. You can only export classifications that have a bibliographical ID (created by adding one of the predefined bibliographical classifications to your project). The bibliographical ID is displayed in the classification properties. To view the properties, select the classification, and then click the Properties image, in the Item group, in the Home tab. Custom attributes are ignored—only values stored in attributes with a Bibliographical ID can be exported. When you import the XML file into EndNote, select 'EndNote generated XML' in the import options. When you import the RIS file into RefWorks, select 'BIBSYS (RIS import Format)' as the Import Filter/Data File. If you import reference data into NVivo and then export it back to a reference management tool, only the data that could be imported into NVivo is available to be exported back to the reference management tool. For example: when you import references into NVivo, only one file attachment per reference can be imported, and any reference information stored in attribute values is truncated when it exceeds 255 characters.